Demeter Fragrance Library has LONG been famous for its ability to turn anything into a fragrance that you can wear. I mean, really, who turns Funeral Home into a fragrance that is actually a beautiful scent? Demeter does! Well now they have a new scent out that even boggles my mind: New Car!!!!! Yes, somehow they were able to bottle the scent of a new car and make it smell exactly as if you have just stepped into a new car. All Demeter fragrances are single note fragrances, meaning they are the smallest possible combination of ingredients that expresses an olfactory idea. The notes are linear, which means they express their olfactory nature immediately and do not change over time. This is very different from the top-middle-bottom notes that dry down and change over time, associated with prestige fragrances. Linear is simple, and simple is great for every day. And because most Demeter fragrances are inspired by every day objects and experiences, they are familiar, comfortable, comforting, and understandable. They create scent environments where people can rediscover the wonderful world of scent that is too often overlooked or forgotten in this modern, multi-tasking world. That is because great fragrance, quite simply, makes for a better day. Ultimately, they want nothing less than to change the way fragrance is used throughout the world. Our association with scent is not instinctual, but learned. And, as Americans, we love nothing more than a new car. And, by reference the smell of a New Car. Demeter used that unique and unusual combination of new plastics, vinyl and fabrics to create a light and wearable fragrance experience, reminiscent of the first time you sat in that new car you love so much. Experience that feeling again and again, anytime, anywhere with New Car from Demeter Fragrance Library. What makes you happier than a new car? Personally I find that quote a bit antiquated but, it does tell they history of how men feel about their cars. The scent itself is quite beautiful and is much more than just a new car scent. It starts out with very light floral note and settles into a powdery note. I absolutely love the scent and feel that it would go over quite well when worn next to a man. I have the feeling that any man would do flips over this scent. For the first time, anyone can fully express themselves in scent. Using Demeter's Library as your fragrance palette, you can design and blend your own custom scent by combining Demeter Fragrances directly on the skin. 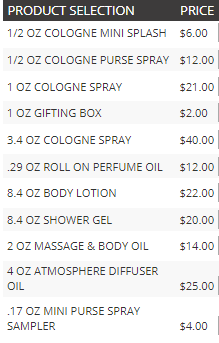 various sequences until you find the scent you want to use on your skin. 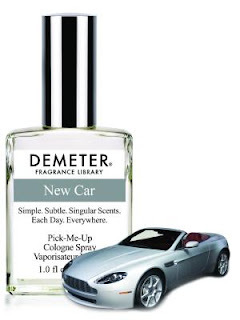 Demeter New Car is available online at www.demeterfragrance.com and anywhere Demeter fragrances are sold. 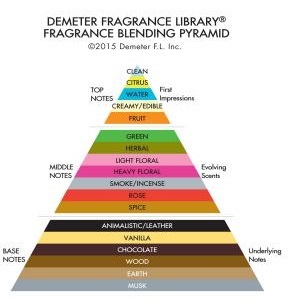 Like Demeter Fragrance Library on Facebook: https://www.facebook.com/DemeterFragranceLibrary; Follow Demeter Fragrance Library on Twitter: @/DemeterCEO; Follow Demeter Fragrance Library on Pinterest: https://www.pinterest.com/demeterceo/ and Follow Demeter Fragrance Library on Instagram: https://www.instagram.com/demeterceo/.